If you're like me, you have a calendar in your pocket for recording apppointments, a calendar on your cell phone, a calendar on your clock radio, and a couple of calendars on your computer. But the calendar you look at 99% of the time is the big one hanging on the wall. 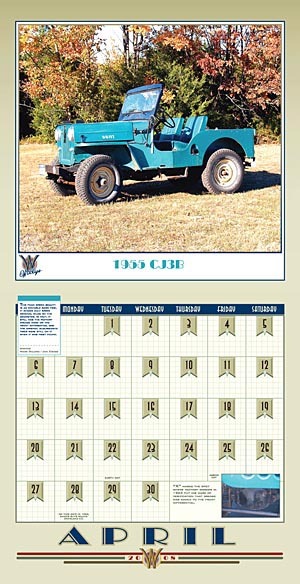 And there are always big picture calendars available with photos of vintage tractors, and calendars with Corvettes, but until last year there was nothing featuring the vehicle which is the perfect combination of those two -- the Willys Universal Jeep. The team of Bill Norris and Kevin Banonis have again put together a glossy, full-size calendar with a big, high-quality photo for each month, and a bonus piece of Jeep literature or information related to each month's vehicle. Along with the standard holidays, they have noted some special dates in Jeep history, although I find myself wishing they had dug up a few more of those little anniversaries to include. This year's photos are again nicely selected from the huge range of what can be called "classic" Jeeps. Compared to last year, there's maybe a little less representation from the flatfenders, and a bit more from the post-Willys era, but high hood fans won't be disapppointed. For April, Bill has scooped CJ3B.info with a beautiful low-mileage CJ-3B which I hope we'll feature on the website in the future. Owner Mark Delano has confirmed that the "1955" label below the photo is actually a typo, and the 3B with 6400 miles is in fact a '63. Maybe the only thing visible that gives it away is the post-1962 style upholstery. Mark bought the Jeep from the son of the original owner, and then discovered that the dealer who sold it 44 years ago was Reuther Chrysler Jeep in St. Louis, owned by Mark's uncle and aunt. I have enjoyed having the 2007 version of the calendar hanging on the wall at home, along with my other Willys memorabilia, photos and toy Jeeps. But it's also been a great way to have Jeep photos above my desk at work, where they might not otherwise fit in. Bill and Kevin also have some of the 2007 edition still available, and I'm glad to see that they are inviting owners of exceptional Jeeps to contact them regarding possible inclusion in future editions of the calendar!